Ten Big Macs does not a Filet Mignon make. And if you insist on trying it anyway, we’re not responsible for the tummy ache. 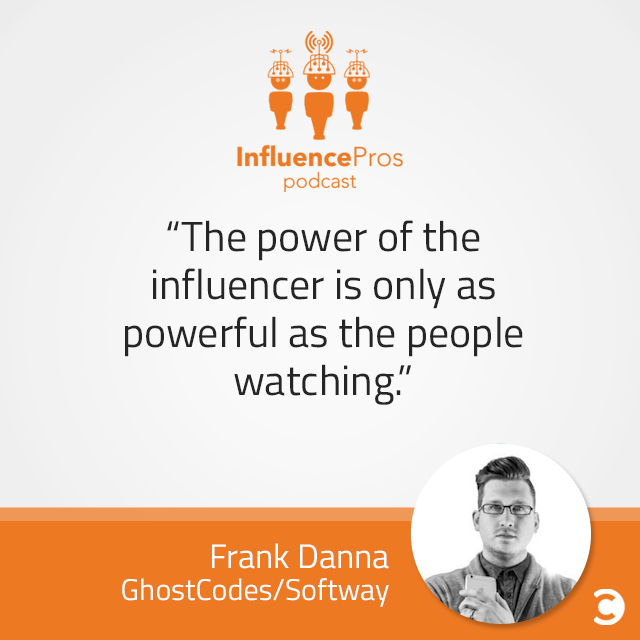 Frank Danna is a wizard of emerging platforms, superior content, and enthusiasm. He believes that quality of content—and not reach—is king, immersing yourself in everything new is important, and that helping just one person makes it all worthwhile. Softway is an agency dedicated to inspiring and using interactive marketing and technology for creative solutions for clients, and Parabox Creative is micro-content production agency focused on short-form storytelling. And let’s not forget about the popular new platforms that Frank co-founded; SnapCodes is a brilliant way to rank and curate the most popular Snapchat accounts, and GhostCodes is a real-time Snapchat search engine. Would you rather be completely alone for five years or constantly be surrounded by people and never alone for five years? I’d have to be around people. I could not survive by myself. I’d have to be able to talk to people. I’d have to choose being constantly surrounded by people. Would you rather have the best house in a bad neighborhood, or the worst house in a very fancy neighborhood? I would have the worst house in avery fancy neighborhood. I could absolutely sell a bad house in a good neighborhood for the property value alone and not have to worry about it. Oh, dance all the time. Dance for days. I don’t want to be a singer.